This post begins a series written by Dr. Roger Newport about how and why the MIRAGE system was developed. I am often asked how MIRAGE came about, how I thought of it and how I designed it. The truth is that it all came about by chance - I was actually designing something else. About 10 years ago I was experimenting with prism goggles. Prism goggles shift everything you see over to one side so that when you point at something, you miss it. After a while your brain gets used to the visual shift and you learn to point accurately again, but when you take the goggles off you overcompensate and miss to the other side (because your brain has adapted to the visual shift). While this is very interesting as it helps us to understand how the brain learns and adapts to new tasks, I felt that the fixed visual shift of prism goggles was too simple and that it would be more interesting if we could create a situation where the brain has to learn something more dynamic and flexible. At the same time, I was also messing about with mirrors. You can try this one at home: Fix a mirror upright on a table (I actually had a big mirror wedged vertically between two tables), then put one hand either side and look into the right side of the mirror so that you can see a reflection of your right hand where your left hand should be. Now repeatedly point backwards and forwards (towards and away from your body) either side of the mirror with both hands between two (or more) fixed points while looking at your ‘left’ hand. After about 40 reaches, stop with your hands at the furthest point and peer round the left side of the mirror to see where your left hand really is. You will probably find that it has drifted off either away from the mirror or towards it without you noticing. Sometimes it can drift more than 20 cm and you still won’t notice. Participant reaching to targets either side of an upright mirror. Instead of seeing the real left hand only a mirror reflection of the right hand (appears like the real left hand) can be seen. How does this work (assuming it has if you’ve just tried it)? When you look in the right side of the mirror, what you see as your ‘left’ hand is obviously actually just the reflection of your right hand. However, because it happens to be in the right place at the right time, your brain will treat it as if it was your real left hand. Your ‘left’ hand won’t be very accurate at pointing to the targets because what you’re actually seeing is a reflection of the right hand (that you’re not looking at! ), so it will appear to miss the target by a small amount each time. 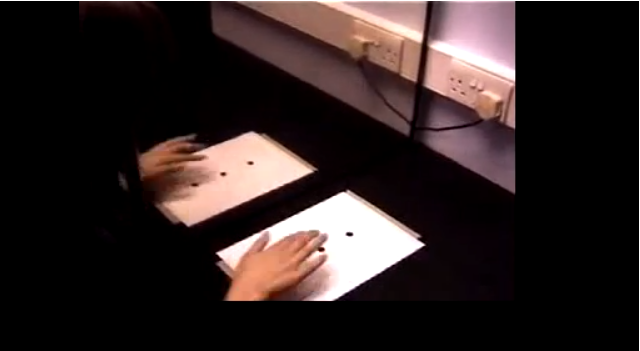 Your brain will try to correct for the error of your ‘left’ hand but can’t because it is actually your right hand, and so over the course of many reaches these small corrections all add up and you find that your real left hand has drifted off significantly to the left or right without you noticing. The direction the left hand drifts will depend on which way the right hand missed on the first reach. Here is a series of videos that demonstrate what I mean. Set-Up as the participant sees it. Note that the 'left' hand appears to be pretty accurate throughout. This video you shows what the hands are actually doing and you can see the left hand starting to drift off to one side. In the final video you can see that the participant almost hits the mirror and even changes hand posture without noticing, demonstrating the illusory power of seeing a hand in the right place at the right time doing approximately the right thing. Next time: How these seemingly unconnected ideas began to fuse into what eventually turned into MIRAGE. Written by Dr. Roger Newport.